How to draw Ririchiyo Shirakiin. Learn to draw an Anime girl character Ririchiyo Shirakiin from step by step tutorial along with easy to follow instruction. 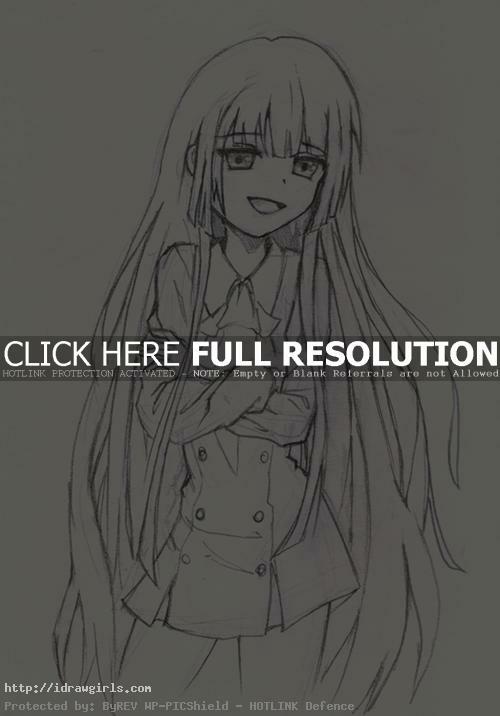 In this tutorial, you will learn to draw Ririchiyo Shirakiin from Anime series. Ririchiyo Shirakiin is the main character of the story, currently resides in room number 4 of the Ayakashi Kan, and is the master of Soushi Miketsukami. Ririchiyo is constantly in distress about not being able to communicate with people properly and decided to move to the Ayakashi Kan in order to be alone. To make the character drawing easier, you should break down the drawing into simple geometry shapes. Good observation is the first rule of good drawing. So before you begin to draw something new, you must observe the subject and make it into a simplify version. It is easier once you make the initial sketch simple. Another important drawing note is to make a correct or accurate drawing. Accuracy makes better drawing so measurement and placement between elements such as space from left eye to nose or from nose to lips are necessary to make your drawing looks better. Positioning initial pieces within the drawing to make it as accurate as possible will make your drawing better. Here is a final drawing of Ririchiyo Shirakiin. Below are step by step how to draw Ririchiyo Shirakiin. Ririchiyo has black hair, a light complexion (skin color), violet narrow eyes, and a small stature. She wears many different type of clothes, but is mostly seen wearing her black deep v neck dress with four buttons on each and no sleeves. Underneath, she wears a white long sleeve ruffle blouse.